Notes: The Chironomid Suspender is a good emerger patter when fish are feeding just below the surface. The CDC will allow the fly to float just below the surface. 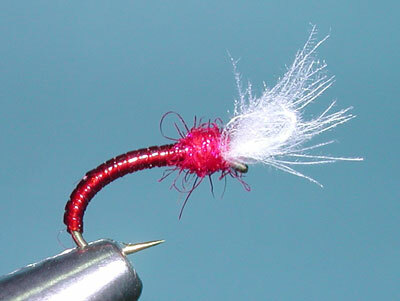 The fly will sit in the water at an angle just like a natural Chironomid. 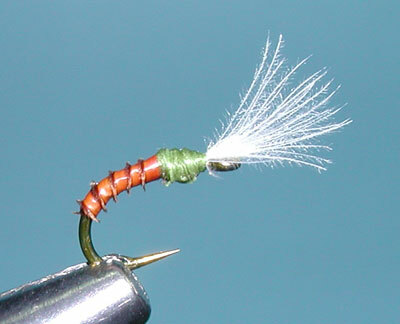 The CDC is often presented as the wing, yet it really represents the gills of the midge. Dutch tyer, Henk Verhaar can vary the floatation of the suspender by varying the amount of CDC he uses. He strips off the barbs of the CDC until he gets the amount he desires, these are attached by their butts about two eye lengths behind the eye with the tips extending over the eye. He doubles back the CDC into a loop wing that is about 1/2 the hook gap, secures the loop, and folds the remaining fibers forward so that they lean against the loop wing. His CDC Suspender Midge uses a Red Micro Tubing to mimic the body of the blood midge. 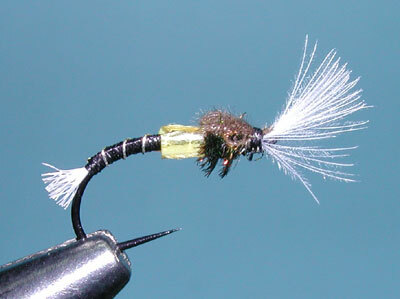 Tyer John Gordon utilizes a biot body with a thread thorax for the Biot Midge Emerger. The biots create a realistic segmentation. It's simple, effective, and can be tied down to a size 26. 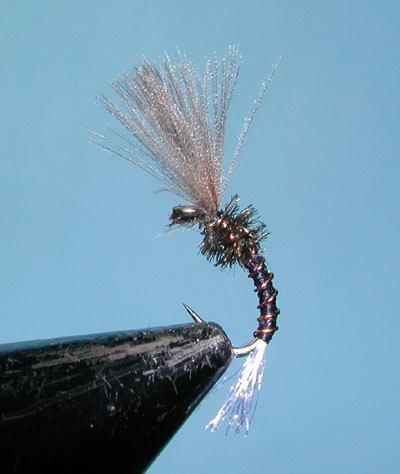 Colorado tyer, Rick Takahashi included many more parts to his suspender pattern, the Hanging Midge. He uses White Poly Yarn for the shuck or tail. The body is a thread body with ribbing for segmentation. This ribbing could be Silver Wire, Colored Thread, or Krystalflash. He uses Orange Goose Biots to represent the wing buds of the midge. These are difficult to find, so I substituted Turkey Biots. Two CDC feathers are used, a darker color for the wingcase and a Tan or White CDC for the wing (Gills). He ties this pattern in Black, Olive, and Gray on a TMC 206BL. The 206BL has a slightly up-turned eye with a deeply curved shank so that the point extends up to the midpoint of the shank for good penetration.